Last week, the JMT Architecture team had the opportunity to tour our new office space on the 5th floor of JMT Headquarters in Hunt Valley, Maryland. JMT Architecture will be moving into the new space later this fall. The space is currently under construction and is about 50% complete. The HVAC system and walls are in place, with flooring, paint, and all other finishing to follow in October. The team hopes to move in early November. The new JMT Architecture office will feature large windows, an open floor plan, multiple meeting rooms, and large charette space. The interior design was completed in-house by our Interior Design team and features our signature brand color and a cohesive furniture plan. The space has been customized for JMT Architecture’s growing team and the collaborative nature of our work. At our current location in Towson, Maryland, our Architecture and Interior Design teams are split between two floors. In the new space, everyone will be together in one cohesive space. After 30+ years in Towson, the move to Hunt Valley also means we will only be an elevator ride away from the rest of the JMT team, including engineers and experts we work closely with every day. The team hopes to visit the office space again soon. 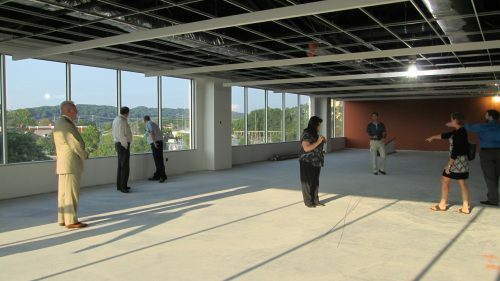 As the Interior Design team continues to provide construction oversight, we will share photos and updates on the space. A recent 360° image of the space can be viewed online here.